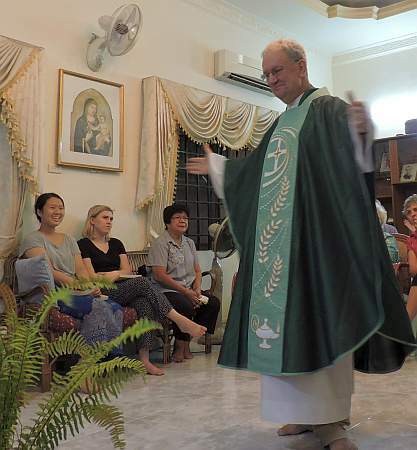 A gift in gratitude – Welcome to Cambodia, and…..
At our weekly Wednesday meeting today, Fr. Kevin Conroy showed off a new vestment he was given in gratitude by a family with a mentally ill elder. The man had been acting out, sometimes violently, but when Fr. Kevin–who runs the Maryknoll Mental Health Program–came to see him, Kevin was able to reduce the man’s agitation and help the family find a new peacefulness.